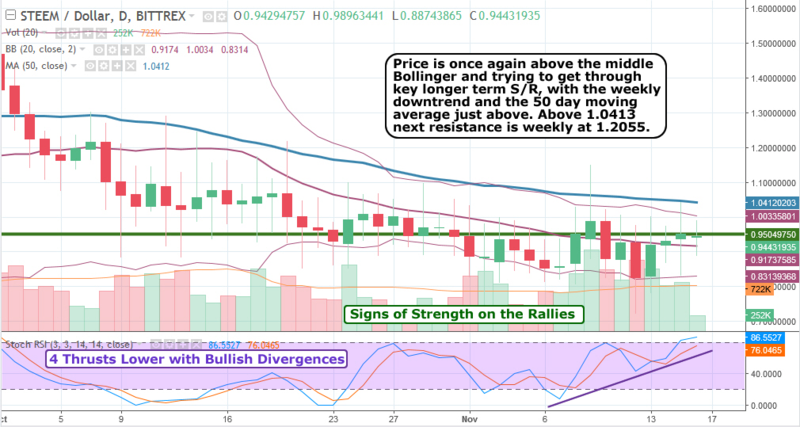 After last spring’s run up, STEEM has spent the better part of 5 months correcting, four of which have seen price bounded on the low end by a key support/resistance level at approximately 95¢. Two weeks ago price fell though that level on a third intermediate term thrust lower, but found support at the 50 week moving average and the lower Bollinger band. Price is now trying to regain that key level with the trend-momentum indicators confirming the attempt. It would be a very positive development should STEEM regain the 95¢ level. The daily chart gives us a “close-up” that confirms the underlying constructiveness of the weekly chart with its expanding volume on up days and bullish diverging trend-momentum indicators, one of which, the Stoch RSI, is seen on this chart. We also see that the third thrust lower seen on the weekly chart is comprised of four pushes lower here on the daily chart, all of which fail to gain strength, although price did reach nominal new lows on each. These are all classic signs of smart money accumulation, and overhead breakout levels are not far away. Zooming in on the 4 hour chart we see a clear inverse head and shoulder pattern on what was the fourth thrust lower on the daily chart (remember, that daily chart was our close-up on the third thrust lower on the weekly chart) with two hammer candlesticks forming its double head, or double bottom as it were. 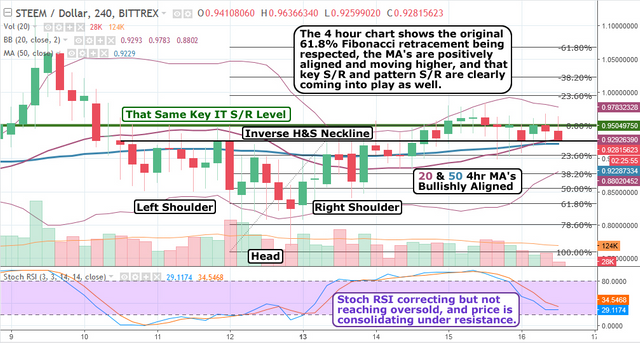 The original Fib retrace was bought and is being respected, and the MA’s are offering support and keeping price in a sideways pattern while the trend-momentum indicators correct, all of which often points to price consolidation just under important resistance levels before an impending bullish breakout. Please leave your comments, input, questions, etc., below! Your support is much appreciated. Please Upvote. In all seriousness, I agree with you. There is a lot happening on the blockchain which ultimately will garner attention. At this point, there is no reason to sell steem or power down. The only ones doing that are the weaker hands. We will see $2 in no time. The common pattern in channel breakouts is a powerful move...we just hope it is upward which should be the case since the price didnt collapse in spite of all the negativity around here. The longer term shot of the 4 hour chart makes the accumulation even more evident. Sideways trading with the Stoch RSI in complete agreement. You very well could get your price. wow excellent technical analysis indeed and you also right with your observations steem can go either way may be up or may be down but yes in the long run and especially after the induction of those SMT's steem will surely go to the moon so right now buy and hodl steem is no doubt a very wise decision, thanks for sharing very nice report and analysis with us, it's extremly helpful. Great technical analyse from you about steem. Steem has been under solid accumulation for the past few period. Also probably accumulation gives way to price mark up. Great updating @cerytographic. 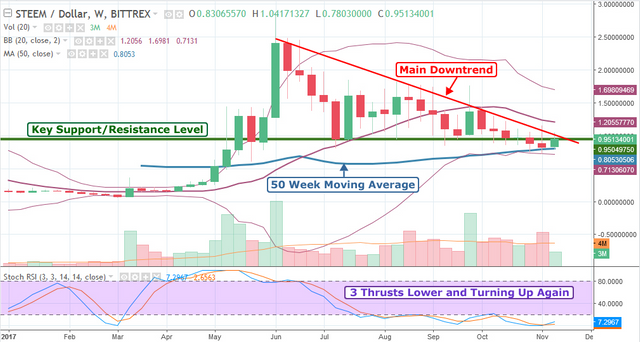 very informational post, well steem is no doubt is under lots of selling pressure from last couple of months and your charts really makes it lot more clearer for me to understand the steem fall and i hope we soon see nice green days in steem, thanks for telling us about how steem looks technically. In the category of technical analysis you are an expert! Specially RSI, MA, STOCH indicators and your expert knowledge gives us great knowledge to trade in right time at right coin! One more thing is, you have deep knowledge in Fundamental analysis as well! Those are amazing! I am not an expert in STEEM, but to me STEEM is the future! So, I wish one day I could see STEEM at the top of crypto list with more than 100 USD for a coin! I think you also believe the same and yeah it will happen too! Great analysis from you friend! This post has received a 1.83 % upvote from @booster thanks to: @cryptographic. This post has received a 0.77 % upvote from @buildawhale thanks to: @cryptographic. Send at least 1 SBD to @buildawhale with a post link in the memo field for a portion of the next vote. The @OriginalWorks bot has determined this post by @cryptographic to be original material and upvoted(1.5%) it! Steem has been under solid accumulation past few time when i saw. Steem price be in under $1 level yet. Sometimes rise up little bit, maybe drop down. I have not look it will going over $1 recently. In this fact further selling and long term investment suitable. 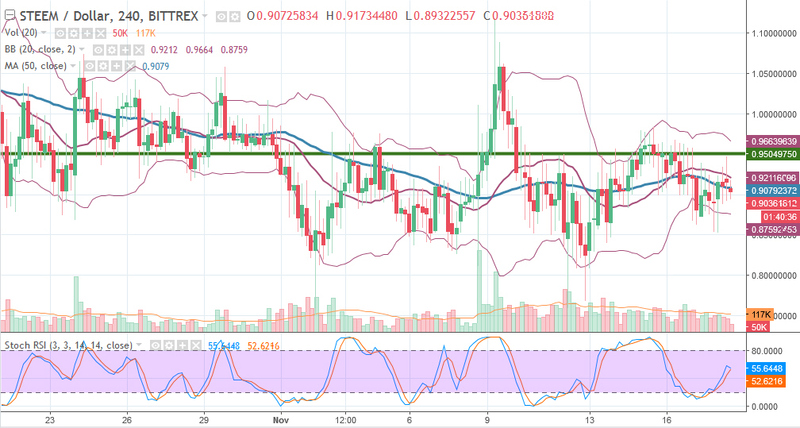 You have greatest technical analyse of steem price.The steem has been under solid accumulation very recent days. Steem would be a very positive development.Its better update us.Look at this graph clearly. Check candlestick. Steem Price is once again will be growth up, always climbing. I cant tell something abt market bcoz Cryptocurrency market is unpredictable. We`ll hopefully waiting steem price higher up more than others. In this fact steem suitable to long term selling bcoz will be price grow up earlier. Thais is valuable post and good info of steem trading. Thanks for info of steem. It does indeed looks good for steem in the long run . Nicely analysed buddy ,it was easy to understand . You have received a Whaleshare Token upvote by the account @officialfuzzy thanks to the whaleshares community and @buildawhale.